nj arts maven: Submit your art to the next TPRFM gallery show! OPENING RECEPTION: SATURDAY SEPTEMBER 22, 2018! We are bursting with excitement to announce that our call for artists to take part in our third annual curated gallery show is NOW OPEN! Submit your work now and be a part of TPRFM history! Opening reception will be held on Saturday September 22, 2018 from 7pm-9pm at Artworks Trenton, the home of the very first TPRFM! Curated by the Trenton Punk Rock Flea Market, Out Of Step: Art of the Counterculture shines a spotlight on punk's current impact on art. This show will feature dozens of counterculture artists who aspire to swim upstream & rise above the common expectations of art with divergent ways of thinking and a strong DIY ethic. 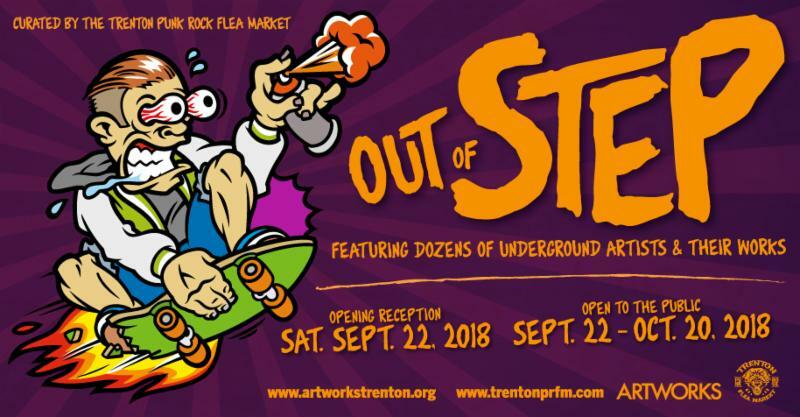 Opening reception for Out Of Step: Art of the Counterculture will be held on Saturday, September 22, 2018 from 7-9pm at Artworks Trenton! Open call for artists will close on Saturday, August 18, 2018.